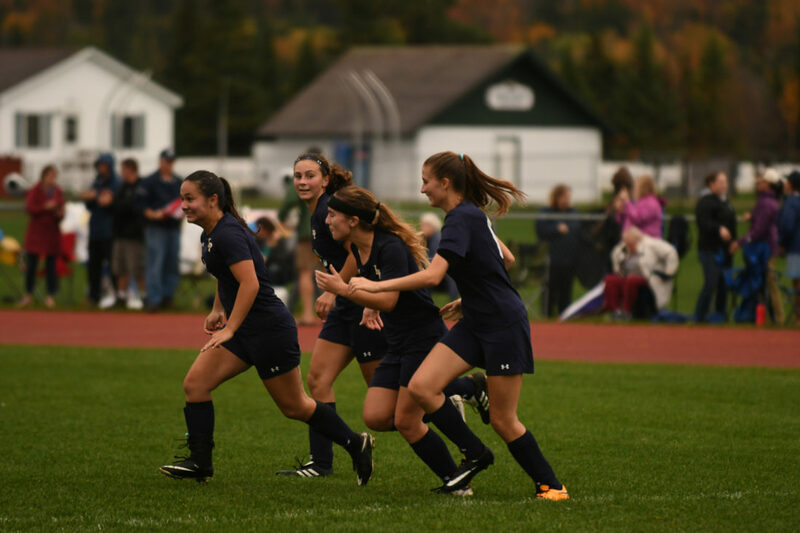 LAKE PLACID — After taking off last year for maternity leave, Lake Placid girls soccer coach Heather Brewer was wondering what type of team she had in store when she came back to lead the Blue Bombers this season. There’s no doubt about it, Brewer discovered that she had quite a squad. 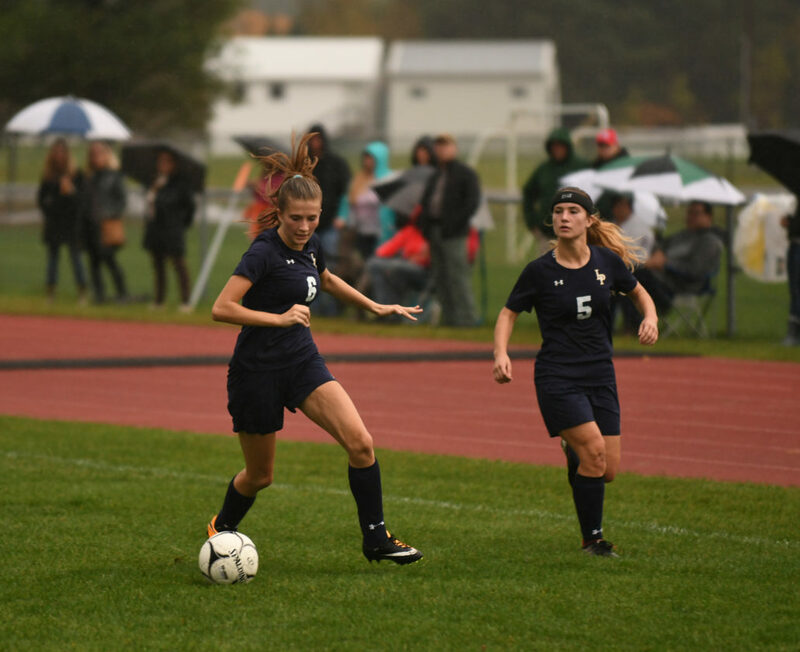 On Thursday, the Blue Bombers completed their regular season by clinching their first ever Northern Soccer League Division II title with a 3-0 victory over Chazy. 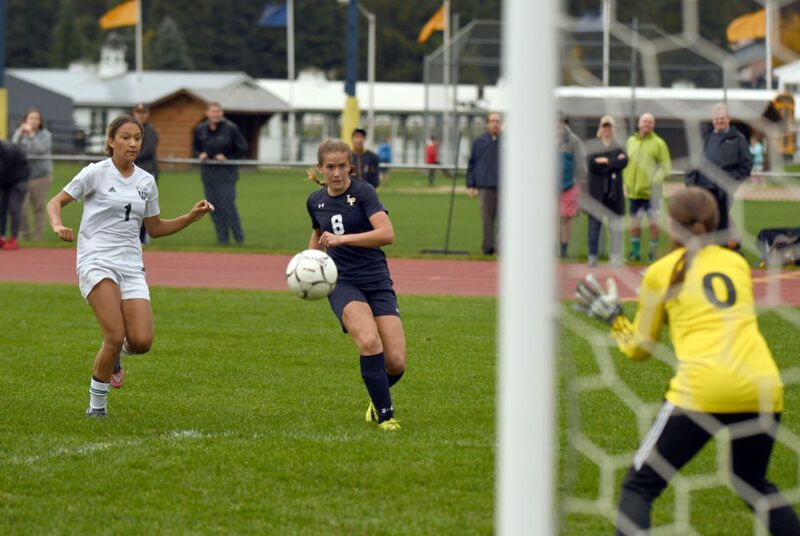 On senior day at Lake Placid’s home field at the North Elba Show Grounds, sophomore Lydia Bullock continued her scoring spree by netting all three Blue Bombers goals, and at the other end of the pitch, first-year starting keeper Brook Paries recorded her fifth shutout win in nets. The Blue Bombers finished the regular season with a 10-1-1 and now wait to find out where they will be seeded among the seven teams that will be competing in the Section VII, Class C playoffs. Bullock finished the regular season with 16 goals. She netted her first two against the Eagles in a span of less than two minutes late in the first half. Bullock’s first was an unassisted tally with two minutes remaining before halftime, and her second game with 30 seconds left off an assist from Makeda Thompson. After putting a few more shots on net after intermission, Bullock completed her hat trick with 5:32 remaining in the game when she took a pass from midfielder Mackenzie Kondrat, came down the left win and fired a shot toward the far corner of the net that deflected off the hands of Chazy keeper Emmy Moak. Lake Placid finished with a 22-17 edge in shots. Lake Placid’s march toward its first NSL championship started looking like a possibility two weeks ago when it knocked off previously unbeaten Moriah, a team that advanced all the way to the state Class D final four a season ago, and also handed Lake Placid its only loss this fall. And when the Vikings lost to Northern Adirondack in their next start after that, the door really opened up for the Blue Bombers. Brewer said ever since her players avenged their loss to Moriah, they’ve gone on a roll in their quest for a regular-season championship. “That’s been our big motivating factor because a division title to me is just as good, and harder to get than a sectional title,” Brewer said. “So for the kids, that’s been the little extra that we’ve needed to push us through.